Whether you have a pair of antique chairs you’re ready to part with or a whole garage full of stuff you’ve collected over time, there are a number of options to clear out that clutter. Not every method works for every individual, and it also depends on the type of item you have and whether you want to ship or sell locally. There are a number of different options for selling online these days. Some people still swear by selling on eBay knowing the built-in customer base is tremendous. If you’re marketing really common items it can be hard to get noticed among the sea of offerings, but rare and unusual pieces still do well whether via auction bidding or fixed price (Buy It Now) offerings. The main drawback is the hefty fee structure although there are options that provide free listings so you only pay after an item sells. You also have to be willing to take returns, because even if you say you don’t accept them, eBay can force you to take a return if they side with a customer’s complaint. Others look to sites like Ruby Lane and Etsy for an online mall experience or set up their own website. All have associated expenses, even if they may not be quite as high as eBay. There are sometimes restrictions on the types of items you can sell or the age of the items that are acceptable in online malls. Be sure to investigate all the potential pitfalls before making a commitment. Also, keep in mind that those who do well usually spend time cultivating a customer base and participating in social media venues to drive traffic. You also have to be willing to spend time photographing, writing listings, and processing orders for shipment. If you have a ton of stuff to sell and are still actively enjoying the thrill of the hunt, this might be your best bet. It will take some work, but for retirees looking for part-time income or weekend flea market warriors, it can indeed be fun to buy, sell, and trade. 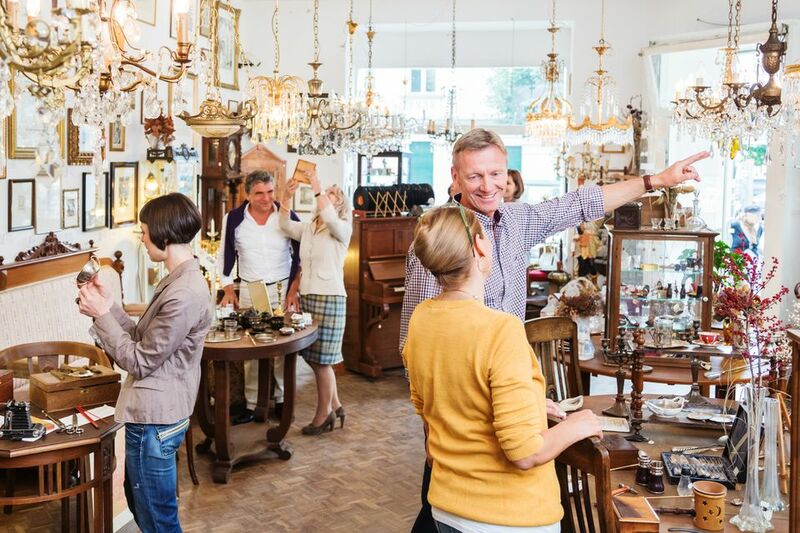 You’ll more than likely have to obtain a tax exemption resale certificate through the state in which you reside to set up an antique mall space or sell at antique shows. This also requires having the space to store your inventory and keep it safe. Many dealers combine shop or show selling with Internet selling to maximize their exposure and rotate inventory. They know they’ll have to hold on to many items for months or even years to find the right customer willing to pay top dollar. If you don't want to get quite that serious about setting up shop, look for small local flea markets in your area that may rent tables on a day to day basis with no long term commitment. Selling to a dealer is a great option if you don’t want to get in the business yourself, and would rather wholesale a group of items rather than hold on to them for what might be eons to get the highest price. Whether you call it a yard sale, tag sale or garage sale, this is another option for moving a lot of junk at one time. You definitely won’t get top dollar selling this way. But when enough is enough and you just need your space back or want to downsize, a sale like this can serve its purpose nicely. Many people doing a big purge or cleaning out an attic sell what they can and then donate the leftovers to charity. Just remember that if your goal is to clear clutter, you don’t want to bring the stuff back into your house after the sale. Price everything to move quickly. Make a commitment to part with stuff if it doesn’t sell, and follow through with that promise to yourself. This is one selling choice many people steer clear of after lots of bad press. But the honest truth is that if you just have one piece of antique furniture to move, it can be a great no-fee option. The buyer will be local (don’t fall for scams with out of town purchasers), and you can require the purchaser to take the item with them so there’s no worry about delivery. If you do decide to sell on Craigslist, just remember to err on the side of caution. If you can put larger items out on a porch or in a garage so strangers won't have to enter your home, do so. Also, consider meeting potential buyers in a public place like a busy coffee shop with portable collectibles you're selling. Some police departments also offer safe spaces for buying and selling, so check with your local authorities to see if meeting up at a station is an option.